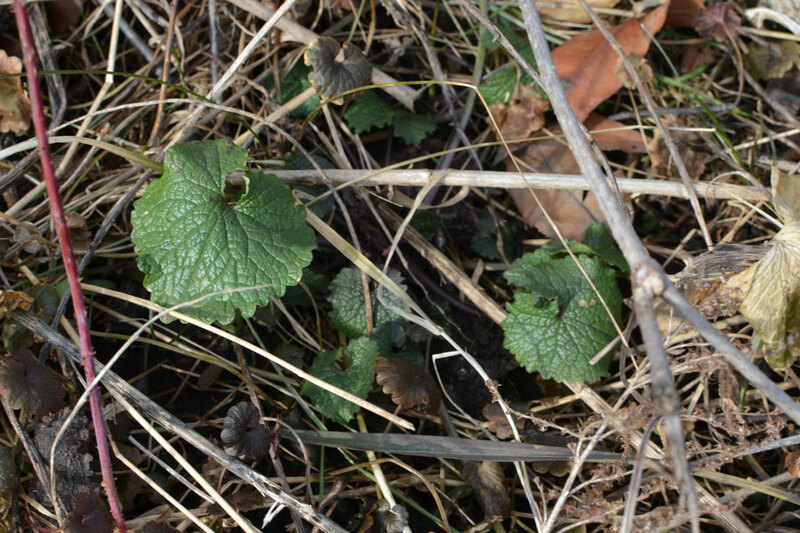 If you’ve been on a meander or walk about in a less than perfect landscaped park near you, you’ve likely run across the notorious garlic mustard. I stomped around the empty rows of the garden just yesterday and came across this very resilient little plant. With the mild winter, it just hung out until now, when there’s just enough daylight each to for it to start growing just a wee bit. A robust weed that loves many a climate, it is spread by the seeds it drops each year. And those seeds may germinate next season, or the next, or… anytime really in the following seven years! The USDA identifies it as an invasive species, brought from Europe in the 1800’s by those pesky immigrants, I imagine. As noxious and invasive as it is, it is not without redemption. The good news is you can eat it and it’s one of the earliest greens to be found. The general recommendation to rid an area of Alliaria petiolata is to just keep pulling it out before it has a chance to flower and form seeds again. There are chemical approaches, but I’m not a fan nor an expert so just keep weeding. For me, the best edible weeds are those that can be picked and eaten directly; a short inspection for visible dirt and bugs not withstanding. I have had my share of weed foraging and have not yet had a bad experience but try to keep in mind a few guidelines. When tasting a new plant, start small, as in a nibble. If a plant tastes bad (as in you want to gag or it dries out your whole mouth), it most likely is bad. Pay attention to how your tongue feels. If it feels itchy or dry or some other unusual feeling, your tongue likely wants you know that it has had enough of that particular weed for now. Wild edibles tend to have much stronger flavors than grocery store produce or even organic, just harvested, local produce. Finally, know where you are picking from. If it’s in the neighbor’s yard who sprays faux green and weed killer on the well manicured lawn or by the mailbox that gets marked by every dog on the block, skip it. Look farther off the beaten path or in your own backyard instead. When it comes to eating garlic mustard, it has a strong garlicky odor and flavor and can be eaten either raw or cooked. I find the flavor to be strong enough that I only eat a few leaves of it on it’s own, but mixed in with other salad greens, it’s flavors mellow. I have not yet tried this, but have read/heard that you can steam or sautee it like you might spinach or mustard greens. Here’s a recipe for using in a pesto and another that suggests putting it on pizza. Beautifully written piece, leaves me feeling a little adventurous!